HEROIC COMICS #72 SPLASH PAGE 1 (1952) Media Type: Pencil and Ink Art Type: Splash Page Artist(s): Frank Frazetta (pencils & inks) Check out this STUNNING, incredibly RARE Frank Frazetta 1952 penciled and inked WAR splash from Heroic Comics #72 and the story titled He Chose to Fight! While justly celebrated for his incredible fantasy art, Frank Frazetta was also a master of all the other comic book genres. From funny animal, to Western, to romance, to science fiction, and war, every Frazetta story is a visual treat. Here, the dramatic life-and-death tension of the battleground is captured in this gritty SPLASH from He Chose to Fight. " This magnificent piece has an image area of 12.2" x 18.75 on a much larger art board. Aside from missing a word balloon in panel two, and a few stains at the lower left, the art is in Very Good condition. Art is signed in ink in Frank Frazetta's classic full last name signature in the artwork! Just send us a message and we can try to work something out. Please find out more about me and my other items here. 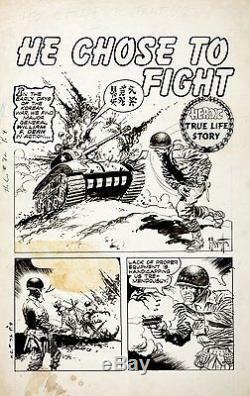 The item "Frazetta, Frank HEROIC COMICS 72 TITLE SPLASH PG 1 Large Original Art (1952)" is in sale since Saturday, May 10, 2014. This item is in the category "Collectibles\Comics\Original Comic Art\Splash Pages". The seller is "romitaman" and is located in Ravenna, Ohio. This item can be shipped worldwide.